Duane began training at Grasshoppers in September of 2006 when the Dartmouth School first opened its doors. He had always had an interest in the Martial Arts, and was looking for a way to get in shape. To this day his enthusiasm for learning and instructing continues to grow. This is evident in the fact that Duane rarely misses a class and is always willing to help out on any adventure. Duane says that one of the best things about being a student & instructor is passing on what he has learned and watching other students grow as they progress through the ranks. 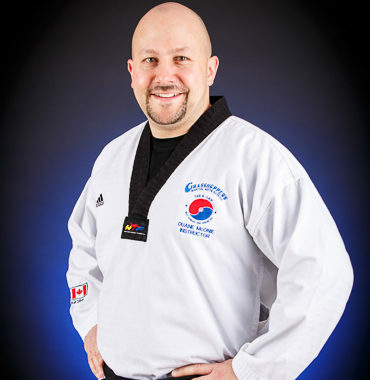 Duane is a 2nd Degree WTF Black Belt, certified NCCP instructor, Provincial Poomsae and Board Breaking Judge, and serves as the secretary for the Maritime TaeKwonDo Union. Duane is employed by the Nova Scotia Health Authority, Central Zone, where he manages Support Services for the Diagnostic Imaging Department.